As I have mentioned a couple of times, I first started writing my blog because I lived with very quiet people at the time and as I am a bit of a talker it was my way to get the words inside my head out there. That may have been the reason I started but just today I have realised the reason I am still blogging. For me, it’s my blog, the comments that are left for me and the blogs I read that are my therapy to help me deal with my grieving process. It is so amazing when I am feeling down or have a question in my head that I can’t quite deal with; somehow I get the answers I need from you my blog friends. I would just like to say – thanks and I class you as one of my “mates”. Hey who needs to pay for therapy – not me! Today Shane and I went to St Andrews Community Market, which would best be described as a “Hippy Market”. This market is on every Saturday morning and I think it has been going for over 30 years. It has quite a range of stalls including Reiki, Clothes - both new and second-hand, Crystals, Really old tools (junk to me but treasure to Shane), Food and so much more. It is a really interesting market to wander around, today was a bit damp with the drizzling rain but it was still good. Before leaving we went to the St Andrews Bakery and bought a loaf of their yummy Cob Loaf. I was so looking forward to getting home and having a slice smothered with butter and vegemite. To all my non Aussie visitors – yes I was raised on vegemite and have it everyday without fail. 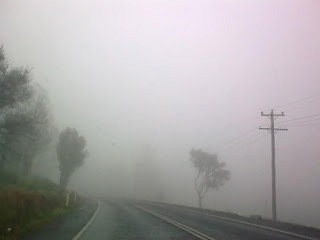 We took the long way home through the Kinglake National Park. Up until February 2009 this National Park was a wonderful green lush park. But in Feb 2009 it was ravaged by the worst bushfires we have ever seen. The dead trees have started to shoot their new greenery but all I could get a shot of was the fog. Oh well I don’t mind I love fog too. lovely phone call from “Angel Michelle” that was a great boost. Davine I recently read an article on blogging, it was rather interesting what they had to say and I had to think about what they were saying. In essence they were saying what you said, it's like a live journal where one can get feedback and it is therapeutic. I love blogging here, it's a mature site from what I have encountered thus far and I feel as though I am sitting in your living room chatting with you. You have become my friend and we have never met which is amazing to me. Speaking of which, my niece has shared with me that she wants to go to Australia next summer for a month, naturally I am going to have to go with her! So as it draws nearer to making our plans I will email you and get some of the "must see" and "don't do" ideas from you, naturally a "must do" is meet you! I am like a little school girl just thinking about this venture of ours, it's going to be a ton of fun and great bonding time with my niece. She will be 16 by the time we are ready to travel. That is unfortunate that a fire swept through the park, and your Hippie market sounds very similar to the one I love to go to here on Saturdays. Good for you, sounds like the market is a cool place to visit. Now I have a question....what is Cob loaf? and vegemite? sorry, I have not a clue. We also have forest area close by that has been devestated by fire. Where I used to take the "church" kids for retreats had a horrendous fire and it destroyed 60% of the that forrest. The camp grounds were saved but much else was just black sticks for the longest time and then the forest started to reclaim the habitat loss and it's been 25 years and there is a mini forest where a giant one used to be. Slow but steady the work of Mother Nature. You know that I understand about blogging and healing, you and the other lovelies have been my sanity as well. Sounds fun!! What is vegement? OK! So I had to go Google Vegemite! I think I've actually seen it in stores here in Ontario, but I also think I've seen a lot of stuff and I haven't! Blogging is so cool because we can't see one another's faces and so you can be totally honest.